It was very hot in Far North Joshua Tree last weekend, and humid - 100+ degrees and 50%+ humidity. It was quite miserable. The swamp cooler does nothing but mock, "You're hot? How about a little more humidity, Scarecrow?" The one consolation is the incredible clouds that traverse the sky all day and night, and the play of the light on the landscape, a spectacular drama for a city girl celestially deprived. The cabin does not cool off when the sun sets, even with the wind whipping through the windows. I could not bear to be in there at night so pulled a bed out to the patio. I no longer cared about snakes or scorpions or anything else that might crawl across me in the night. A warm desert breeze grazed across my body as I lay on my bed. I watched the half moon set, dipping occasionally behind a cloud. For its finale the moon appeared deep orange just above the horizon, lighting the edges of the clouds. 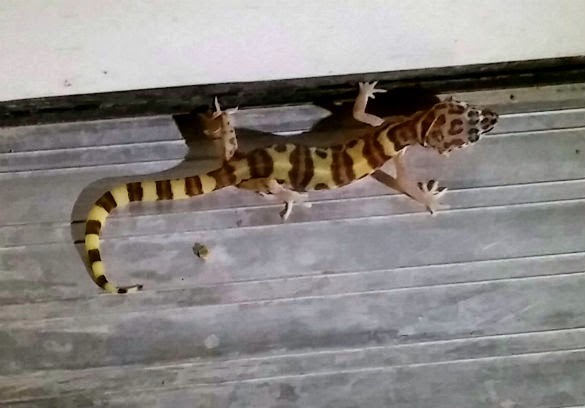 My son came outside for a minutes and found a baby banded gecko by the door. 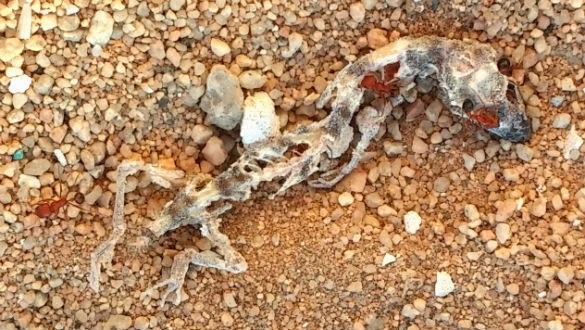 The gecko must have been ill or distressed for we found him dead in the sand the next morning. The change in light awakened me about 5:00 a.m. The sun was beginning to rise. 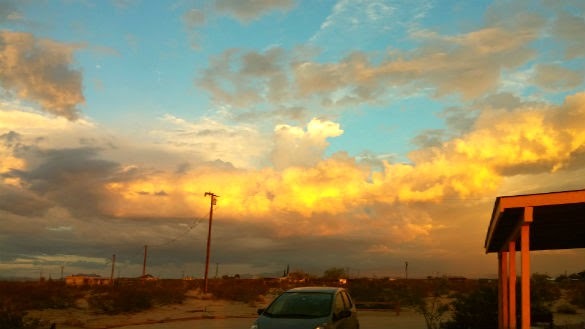 In the west lightening flashed and the air smelled of creosote. At 7:00 a.m. I could see it was raining over Big Rock and the Marine training center. 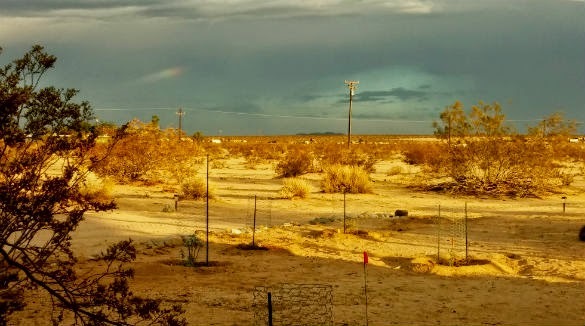 The smallest sliver of a rainbow hung off a distant telephone line, like a dish towel. 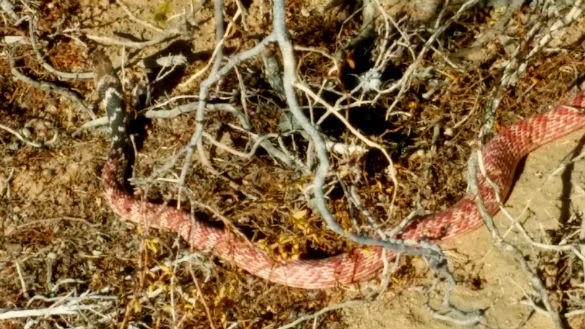 I tried to take a picture of a mockingbird in one of our creosote bushes but just as I was about to snap the photo the mockingbird jumped down to the driveway, where I saw a red racer snake that it had been dogging. I followed the snake for awhile and did catch a video, which I may post later. I take it as a very auspicious sign to see a snake, especially a non-poisonous one. 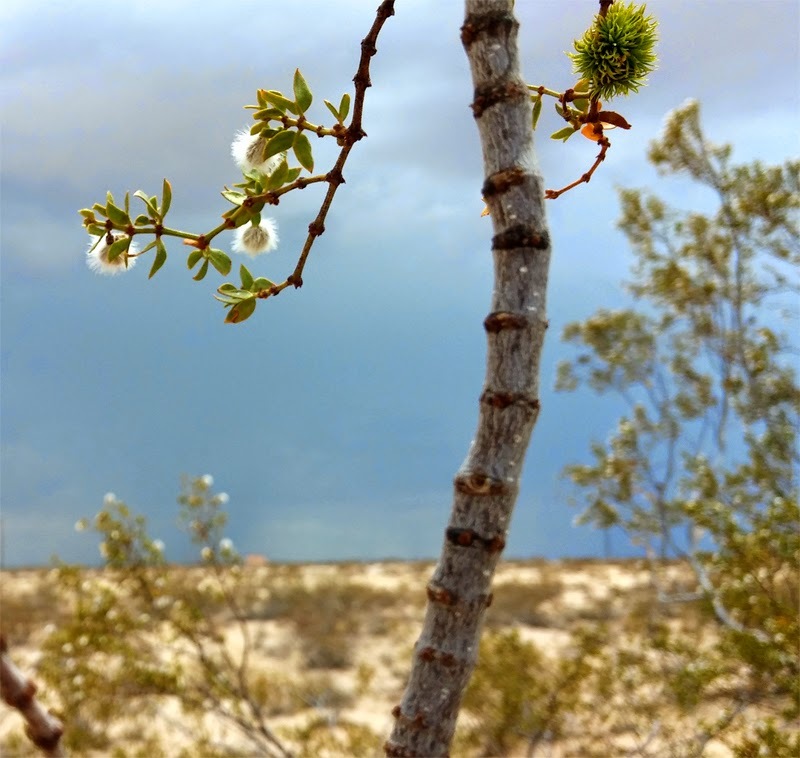 At one point in the day, when skies were dark, I took the opportunity to take pictures of the larrea trees (creosote). This is from my favorite, whom I named Terpsichore after the muse of dance. I had never seen a green gall, only the dead brown ones. These are formed by parasites, the Creosote Gall Midge (asphondylia). They chew into the branch and the tree responds with a gall of deformed creosote leaves. On Friday night a bunch of us went to the Palms for Eden's birthday. I hadn't met Eden (formerly Peggy) but know she's associated with High Desert Test Sites, and she seems like a swell gal. There was a spectaclular sunset. 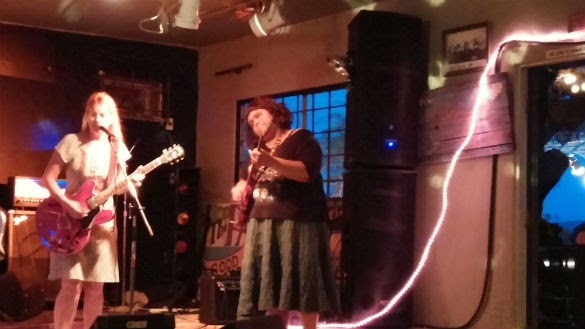 The Sibleys played with Leslie Mariah Andrews who later rocked the house with incredible bluesy tunes. 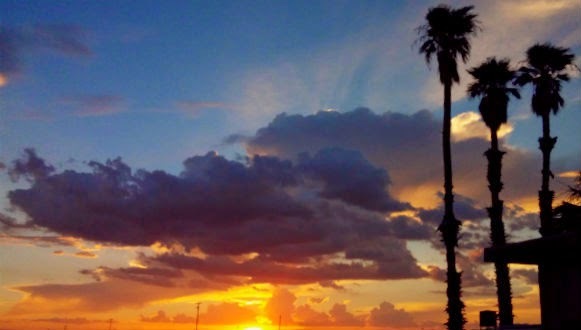 I love the ambiance of the Palms. It's not a restaurant or bar in the regular sense. It's more like a cooperative run by truly benevolent rulers. It really feels like home. The next morning was the Monthly Pancake Breakfast at the Copper Mountain Mesa Community Association. I worked the door, taking money and giving tickets. We served 65 breakfasts and then ran out of food. Steve and Kip cooked, Annelies and Patrick served and Mary Helen did the dishes. Incredible volunteers. Annelies also made everyone a 4th of July cocktail - a rum and piña colado mix over ice and strawberries and blueberries. Way to drive traffic to the community center, Annelies, with fabulously delicious cocktails! 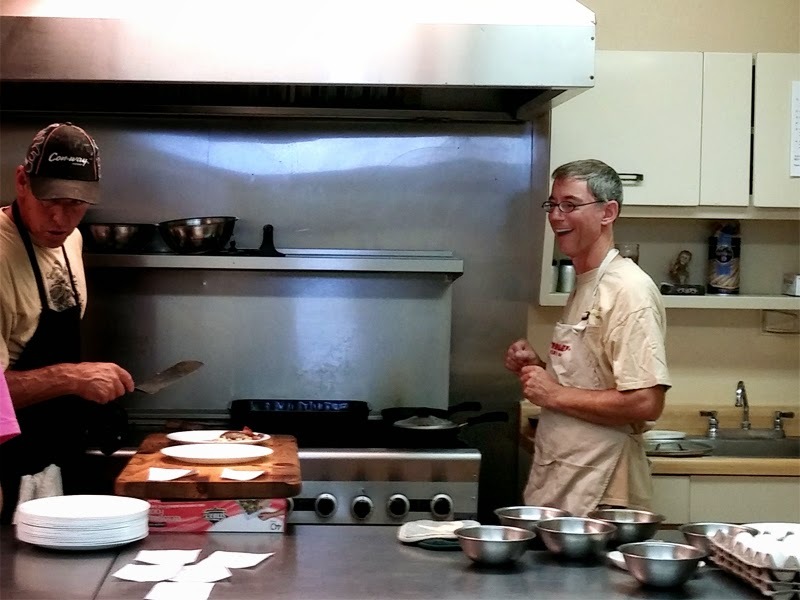 Steve Tuttle and Kip Fjelt cooking breakfast. 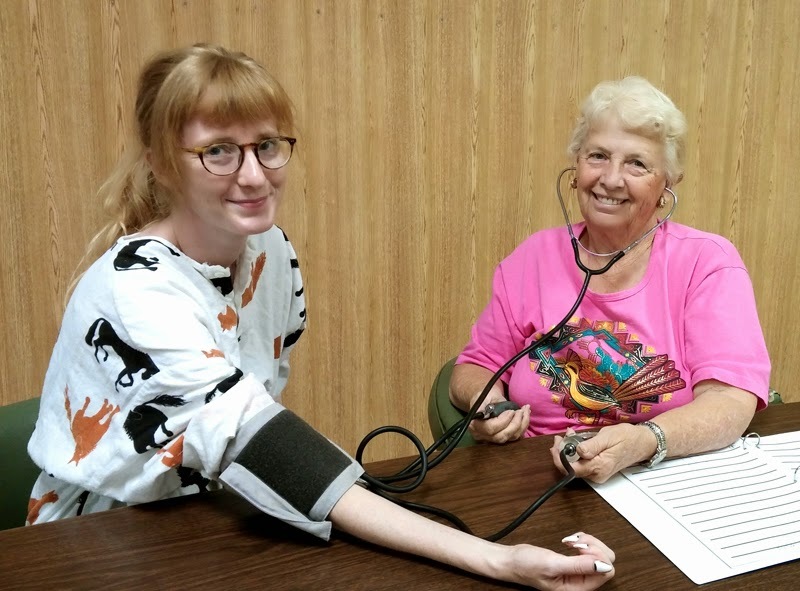 Stevie gave us all free blood pressure tests in the back of the room - helping to keep us all heart healthy. Stevie (right) testing Kelly Gazlay's blood pressure. When breakfast was over, the dishes washed and the receipts counted, all who worked the breakfast congregated on the patio and watched the rain fall over Joshua Tree Park. 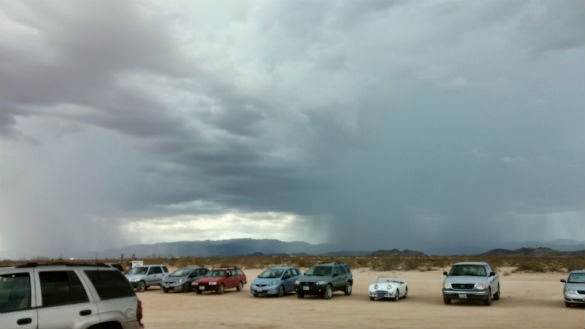 At once everyone's phones blared an emergency signal and we were all warned of flash floods in Twenty-nine Palms. No one was headed that way so we just sat awhile and watched the lightening and listened to the thunder. As you can see here, we all marveled at the six inches of rain that fell on the mesa. 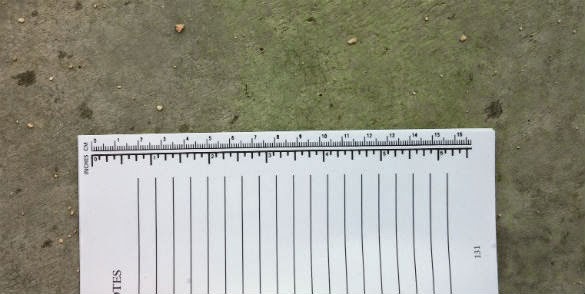 The ruler from the Field Guide to Desert Holes shows we had six inches of rain. Saturday night we walked the wash over to Gloria's house where Kip set up a movie screen and projector to test for an upcoming movie night at the Community Center. 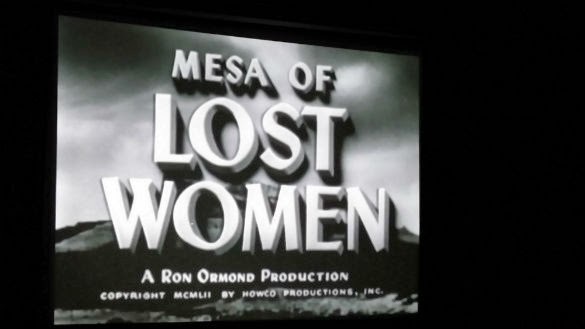 We watched Ron Ormond's Mesa of Lost Women as dry lightening flashed in the night sky over Twenty-nine Palms. It was a pretty bad movie with what Ken described as a punk flamenco soundtrack. Still, great watching it outside, and a dreamy walk home across a dark desert. Before we left yesterday I checked on our gecko. In the course of 24 hours the ants had stripped him to a skeleton, which I then removed and placed under a larrea tree. The gecko's fragile beauty was broken down and reclaimed by the teeming and largely unseen life of the arid forest. 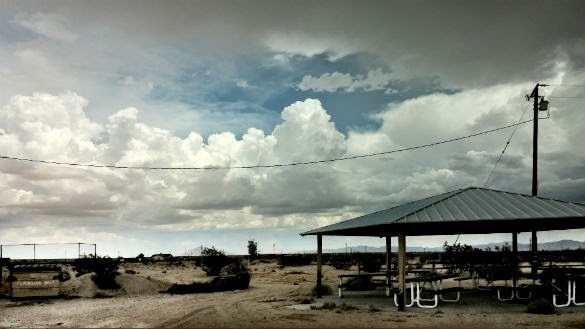 This place, the Mojave, at first seeming so barren and lacking in distinction, is full of beauty and love and surprise and drama for all who take the time and make the effort to see and feel it. 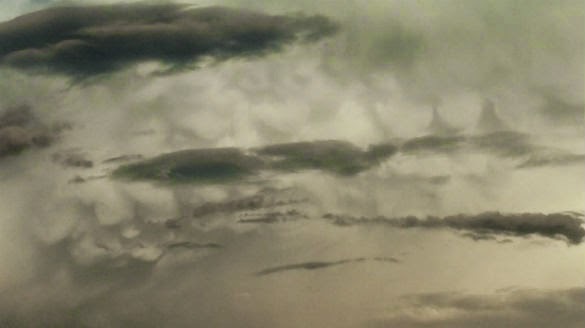 Two more cloud photos gleaned from hundreds that we took over the weekend.